Quick experimental sketch for email sketchbook skool assignment. Orange colored paper stock with water-soluble crayon a sharpie and white marker. Absolutely something to try again! The colors are so different…not exactly what I was hoping for, but it’s fun to try something new. I really like using the white marker, and I actually picked the sharpie up by accident. Once I started with it however, there was no going back. I had intended to use a water soluble ink pen in order to get some funky shadow. I will have a do-over with that technique. 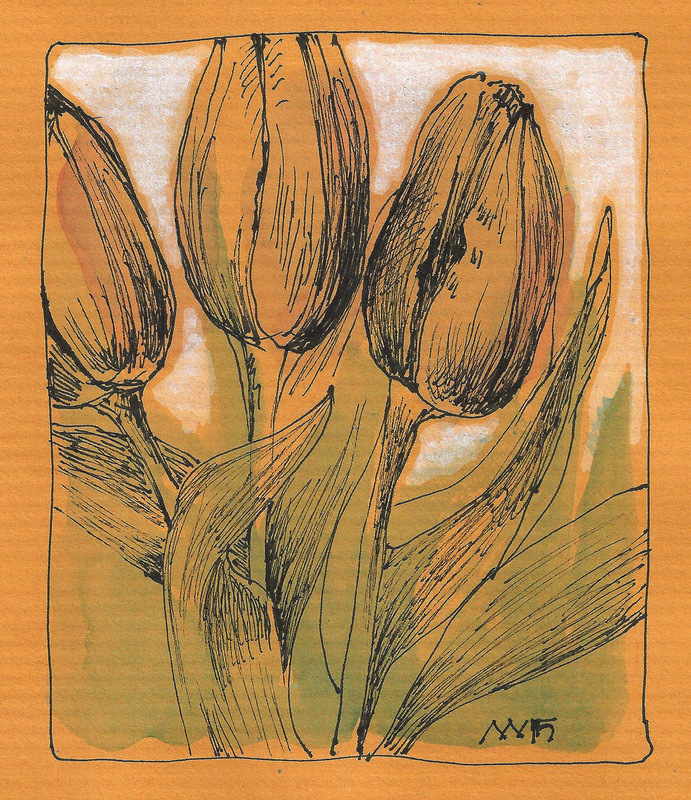 This entry was posted in #sketchbookskool, art, art journal, drawing, flower, nature, sketch, Tulips and tagged #art4all, art, art experiments, art journal, artist, colored paper, drawing, flowers, ink pen, sketchbookskool, Tulips. Bookmark the permalink. I love this. I always like to see tulips done up in different media but this looks so good on coloured paper. I was using Canson Mi-Teintes for a sketch a few weeks ago and loved it. Things just pop, don’t they? You have a real affinity for pen work! I haven’t really done much on colored paper, but I like it! I am using old paper samples for printing projects–not sure that the paper is archival. Of course, I am using a sharpie, so I probably shouldn’t care about that. It’s a cool approach 🙂 The pen work is helping me with commitment for sure.